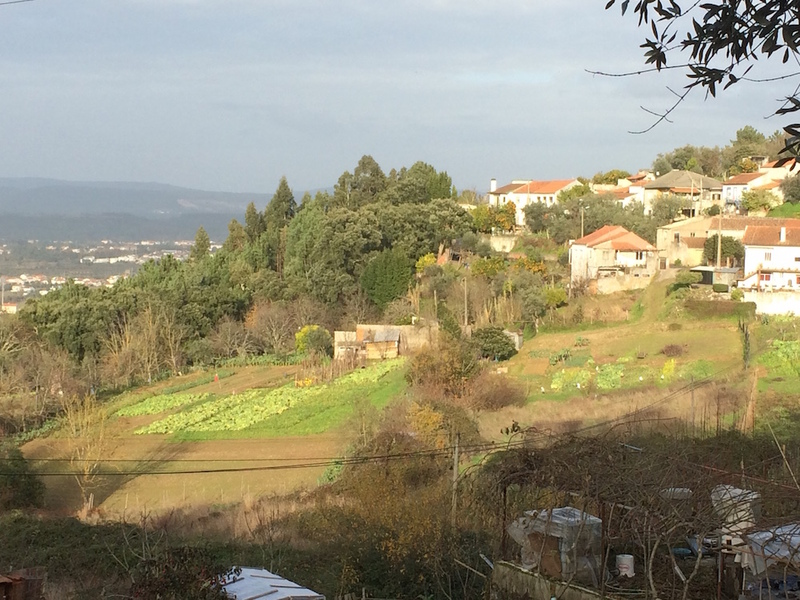 Just had two weeks in central Portugal, near Coimbra. The Iberian peninsula is not somewhere I am that familiar with, but would increasingly like to be. It is home to some 6,000 native flowering plant species, scattered over an amazingly wide range of habitats. A brief foray into Spain last spring made me feel very optimistic about spending more time in the region. Central and northern Portugal however been a bit of a reality check. It seems to be home to one of the biggest accidental experiments in ecology I have ever seen. One which looks disastrous and which has had amazingly little publicity, at least outside the country. The problem is Australians. Not the people I hasten to add, but eucalyptus and Acacia dealbata – the familiar mimosa and Acacia melanoxylon. And a New Zealander – Pittosporum undulatum, and increasingly the South American Cortaderia selloana – pampas grass. I have, as many of you may be aware, often been pretty sceptical about much of the currentdiscussion of invasive aliens. I have always felt that people in Britain who worry about impatiens or Japanese knotweed have very little idea of the damage that really invasive aliens can do; and that many 'invasives' are actually not so bad. Increasingly there is evidence that alien species can even play a positive role in the development of novel ecosystems. Portugal is a good example of where things can go really really wrong, but also just how complex these issues are. To start with the deliberately spread alien, the eucalyptus, mostly E. globulus. Almost any vista in the region between the mountainous east and the coast, north of Lisbon, that we drove through included it, in vast quantities, the distinctively bunchy growth of the outermost branches being particularly conspicuous in silhouette. Almost all the hills are covered with it – nearly all planted as a forestry crop for the paper pulp industry, although it also has some capacity to spread by seed too. 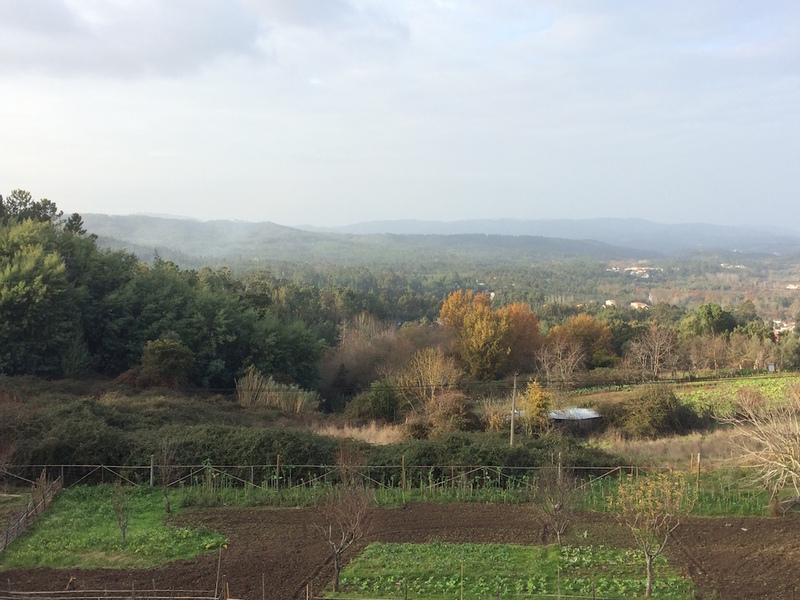 The story is that much of this region has granite or other acidic soils, and is not much good for the pastoral agriculture that one might expect in hilly regions, or indeed for cork oak, which is a major form of land use in the warmer and more calcareous south which the tree prefers. Historically, these hills were dominated by oak and chestnut but centuries of deforestation resulted in them being covered in scrub: gorse, heathers, cistus and suchlike. Economically pretty useless. Pine was often planted or spread naturally. But during the 20th century eucalyptus was introduced and promoted under the Salazar regime (always nice to have a fascist dictator to blame!). The paper pulp industry continues to promote planting the tree. The result is an oppressive monoculture, which with the decline of the pulp industry (now moving to South America), is going to be increasingly worthless. To say nothing of the fire risk, posed by this infamously inflammable tree. A eucalypt fire can turn whole landscapes to ash. Eucalyptus is a controversial crop. One can't blame poor rural regions for wanting to earn money from forestry. And in fact in terms of the big environmental picture it is actually a good thing. The vast area under the tree here must have soaked up a huge amount of CO2, done much to help reduce soil erosion and hold water in the ground. 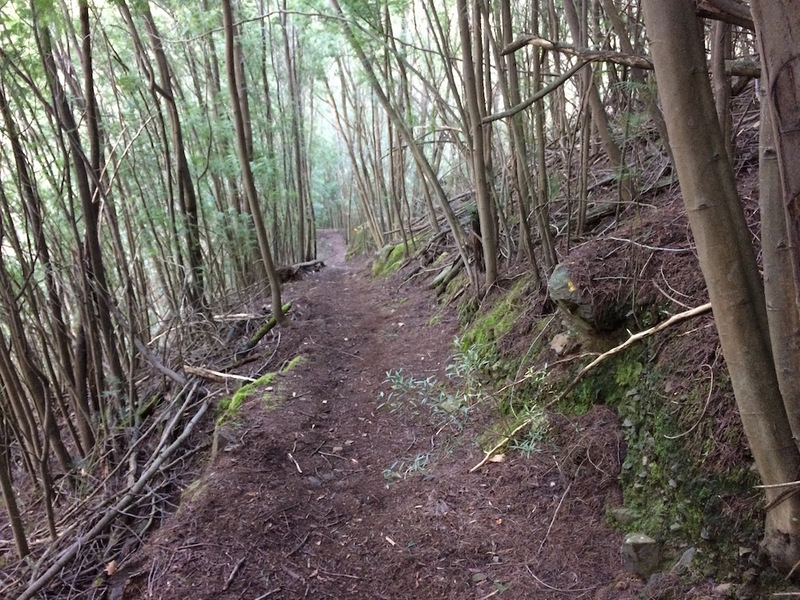 There is a widespread belief in much of the world that the trees dry the soil out, but in fact there is little evidence that this is the case. In very poor regions their presence can actually help protect native forests by being a superior source of firewood and timber, e.g Bolivia. Eucalyptus plantations have been accused of being 'green deserts'. This is not necessarily the case either, as from what I have seen in most unmanaged plantations is that amongst older trees there is extensive undergrowth in the form of gorse and heather or bracken (western Europe's main invasive non-alien). The problem is that the trees themselves do not support any biodiversity, unlike native pines or even better, oak. One of their worst aspects is that they are more or less indestructible; fell them or burn them and they simply pop again from the base, getting way ahead of any pine or oak which might compete with them. Planting them has been an almost irrevocable decision. The result is a lifeless green coating over almost all the hills. It is as if the country has signed a Faustian pact with a malign fairy, who agreed to reforest it, but with a green monster which will never go away and supports no life. Worst still are the uninvited aliens, the escapees from ornamental cultivation which in the moist mild climate are seeding and spreading at an incredible rate. Mimosa is a particular menace in the central part of the country. It is the perfect example of the worst kind of invasive alien: rapid-growing, rapid-seeding, nitrogen-fixing and almost totally suppressing all other plantlife. 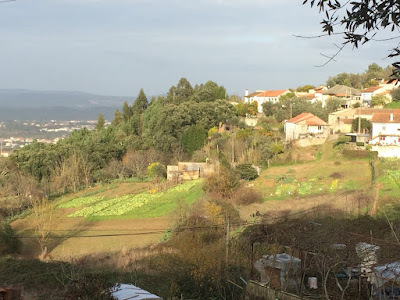 Talking to locals in the area about Lousã it appears that in the last ten years they have spread along roads and streamsides to form a kind of foreground to the eucalyptus. They root into cracks in rock, into banks, over streep, into established maquis vegetation, and then grow incredibly densely. The shade they cast is so dark almost nothing will grow beneath them, killing off entire ecosystems. In many circumstances, these short-lived pioneer species would be replaced in due course by longer-lived canopy trees but there is so little here to seed into them that that is simply not going to happen. 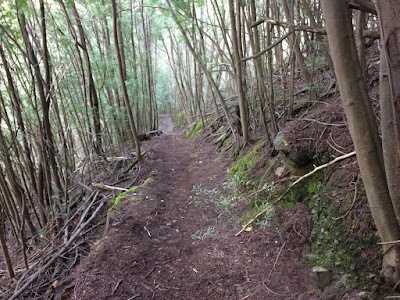 The danger is that the tree will become self-perpetuating, smothering what is currently the main refuge for much native vegetation along the eucalyptus forest margins. Environmental activists have long been warning about eucalyptus. There does seem to be a growing awareness, but once the tide of opinion has turned, it is going to be an almost superhuman struggle for a not very wealthy country to manage this gigantic and multi-faceted problem. I am saddened to see miles and miles of these trees. Hopefully more people will go back to decidous and native species if the paper industry is disappearing and it will be good news for the rivers too. I had not really appreciated many of the negatives you mentioned in this blog.One further thought is that the aesthetics of the trees is not great. I have never seen a really attractive eucalyptus tree. I have recently got back from Myanmar where they are also spreading. Excellent article and a salutary lesson on non-native imports - sad indeed if "the market" has moved on and left them with this huge problem and they probably did not make much out of it while it lasted in any case - your line about 'Planting them has been an almost irrevocable decision' is bad news indeed. On a two week driving holiday on Madeira I was astonished to see huge tracts of them and thought they were just a quirk of nature them being present on the island (on a lot of the higher slopes in the centre of the island) and very pleasant to walk through on a hot summer day actually - but I guess these are not native here either. And of course they have had some terrible forest fires. In South Africa we have similar issues with eucalyptus and Australian acacias. Currently some furious mountain fires and seven houses destroyed. But we are making steady progress removing the pine plantation at Tokai, to restore the fynbos. Wonderful to see the plants ARE returning from the seed bank, once the invasives are cleared. Also the streams flow again, once the eucalyptus and pines aren't drinking all the water. Thinking of the Acacia problem, my good friends in Taiwan showed me the goat industry in SE Taiwan where the goats were confined and their forage brought to them. The forage was from mountain sides of some kind of Acacia, cut and hauled to the goat facilities. Not sure what the salable product was: meat or milk/cheese. Probably the former. An idea for Portugal? 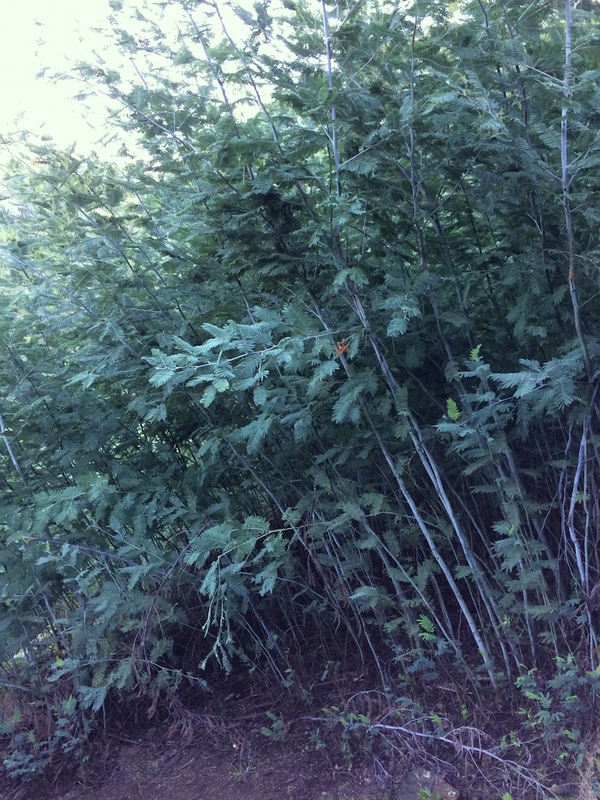 Figure out a marketable use for cutting/removing/coppicing the invasives? Iam pleased that you have raised the problems that can be associated with 'invasive' species. In New England and south to Washington last year, we saw vast tracts of Japanese Knotweed. I was wondering whether some controls were being put in place or whether it is too late to defeat the species. I live in the home of the eucalyptus and the acacia and they are incredibly overrated. Eucs are allelopathic, most are ugly, they discharge limbs over all and sundry, 8% volatile oil, messy, negative impact on soil structure....I could go on, but it is disgraceful how it is legislated that we must live within a fire dependent eco-system by many councils and state and federal law. Absolute insanity here in Oz. In reality the cork oak prefers acid soil, it´s not common in alcaline soil (there´s are others oaks). The problem is that most people only wants to plant rapid growth trees like eucalyptus, because they can give profit in 7 to 10 years, unlike oaks and other trees, that only grandchildren will profit. And that´s because there is not yet a good forestry policy supporting a sustainable forest (too many economic´s interest). Let´s hope it can be better in the future. By the way, isolated, old eucalyptus trees can be beautiful, but we should be aware of the fire risk, and the abundant self-germination capacity that the seed have been showing after fires. From a small pocket in Gippsland, Victoria. I think on the noxious list in its home state. HOW COULD THEY? VOTE FOR TRUMP?